I'm really enjoying working on C6 on lap steel on an 8 string (low A high G). My main outlet for playing these days is gypsy jazz/django kind of stuff. I play a selmer style guitar for that. I was wondering how an 8 string dobro might work for that. I guess I don't hear a lot of people playing C6 on dobro but not sure if there is a reason for it or just stylistically it wouldn't work. The sessions are usually acoustic and regardless the lap steel would sort of be an instruction, but if the dobro worked and could be loud enough to cut through it would be cool and give me more opportunities to work on my playing. Good idea or waste of time and money? There doesn't seem to be a standard, but a lot of people do G6 on 8-string dobro. C6 might sound a bit thin, so a good compromise may actually be A6. In any event your knowledge of C6 should transfer pretty easily. Due to string gauges, cone load and whatever tuning you choose 8 string dobro may not always sound quite like an ordinary dobro (whatever that means). Not saying good or bad, and depends on what you want. Definitely a 6th tuning -- not sure which one. Someone here will know. I tuned mine to G13 which is just raising the 6th note on the bottom of the G6 tuning from an E to an F.
On the album Hawaiian Touch, Barney Isaacs plays C6 on Dobro (E on top). I strung up my Republic tricone with C6 (E on top). It makes more sense for me and as long as you get your string gauges right, works just fine. Is there some structural reason the dobro is usually tuned in G? I just went back to G tuning though because I have a couple of bluegrass-y gigs this month. Over half of the songs are in the key of G and the band expects to hear the signature bluegrass dobro sounds of G tuning... hammer-ons, pull-offs, unison notes in the key of G. The G tuning also has the low rumble of the wound strings. C6 is missing that. But it does offer more interesting chord sounds and more convenient scale patterns IMO. Structural reason: that's an interesting question. Mike tuned G6 for this. I have my Gold Tone Beard tuned to E13... ir rocks at acoustic jams. DMinor Bennet plays a Benoit 10-string in C6 and kills it, search my YT channel for their videos. Don’t just re-tune, you need different gauges for a six tuning. My Beard came with G6, btw. 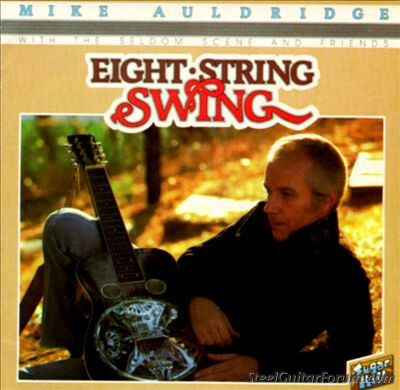 Mike’s instructional video has some lessons on 8 string C6 dobro tuning. I put C6 on my Adams 8 string and it worked fine. As far as string gauges, would a set of normal c6 10 string pedal steel strings work? I often string together sets from pedal sets... Guitar Center has pedal steel sets, but no lap steel or 8-string lap sets. I'll buy singletons of .024p to fill out the gaps, I like a fat plain for the middle strings. For acoustic, I like bronze, or p-bronze, so I use a 12-string acoustic set to piece together 8-string E13 or C6. Beard sells a bronze 8-string set for their 8-string reso, it's tuned G6-Em7 (high 3). John Pearse/ Breezy Ridge has quite a variety of sets for electric and acoustic steel taylored to lots of different tunings. Kevin Maul: Asher, Beard, Clinesmith, Evans, EXCEL, Fender, Fishman, Fluger, GFI, Gibson, Quilter, RAM, Redline, Rickenbacher, Sho~Bud, Supro, ZKing. ...but ditch the top .010, and add a single .036 or .038 for the low C? Or keep it as high C6 (top 5th) if you prefer.